Let’s Go Explore Books About Kites! With the Kids and Kites Festival around the corner, there's never been a better time to explore the science and history of kite making. 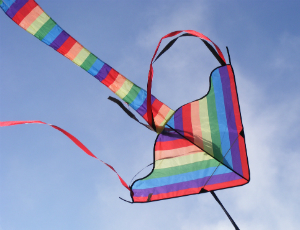 Did you know that kites were invented in ancient China? Discover the history of these beautiful flying contraptions in Kites, which includes instructions for making your very own kite! Join overlooked and underappreciated Princess Djeow Seow—whose name means "the smallest one"—in The Emperor and the Kite as she uses kites, quick thinking and a little ingenuity to solve a big problem. This Caldecott Honor book uses gorgeous patterned illustrations to put a fresh spin on a traditional princess story. If you were building a kite of your own, how would you decorate it? Bob and Hannah can't decide, so their babysitter proposes a clever solution to stop them from bickering. Learn about the mathematical concept of symmetry and its connection to smart kite design in Let's Fly A Kite. Become a kite engineer with some help from The Magnificent Book of Kites. This guide to kite making contains hundreds of illustrations, so you can experiment with dozens of different kite styles and techniques. Once you've gotten the hang of it, try designing your own! If, after working your way through The Magnificent Book of Kites, you still haven't gotten your flying machine fix, Fantastic Flying Fun With Science has got you covered. Design superior paper helicopters and airplanes and even build a hovercraft. Ideal for future astronauts, aviators and engineers!